We Have Space for Your Group! Are you looking for a place to hold a community meeting, theatrical performance, potluck dinner, birthday party, or other event? If so, you may be interested in renting space at St. Paul’s UCC! Our Fellowship Hall is currently being rented by Stoverstown Community Yoga on Thursday evenings and Saturday mornings. We’ve also hosted birthday parties for children and adults, holiday parties, pancake breakfast and spaghetti supper fundraisers, music lessons, and numerous other events organized by our members, friends, and neighbors. · Our outdoor gazebo, a popular location for weddings. 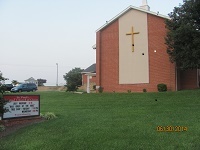 · And, last but not least, our sanctuary, ideal for weddings, funerals, and other large-scale events. Our building is also wheelchair accessible on both the upper and lower levels. For more information about our current building rental rates and policies, please visit our Church Use Page . Our rates are negotiable for non-profit organizations and other groups wishing to rent space on an ongoing basis. To check building availability, please see our online church calendar. Our building rental packet also includes an application form and insurance waiver, which must be completed and returned to our Church Administrator, Dennis Hall, to reserve your space. Once your application has been received, Dennis will add your event to our calendar and contact you to confirm your reservation. If you would like to schedule an appointment to tour our building in person, please contact our Administrative Assistant, Dennis. He works part-time and is in the church office on Tuesdays, Wednesdays, and Thursday mornings, and is always happy to meet with current and prospective renters and answer any questions you may have. Please also note that smoking and drinking alcoholic beverages are not permitted on the church property! Your wedding will be one of the most memorable events in your life. We believe that this is a most sacred experience. We are eager to help you to make it a joyous and significant occasion for you and for all those who will be there to join the celebration. Please see our wedding booklet which aims to familiarize you with St. Paul’s UCC’s approach to and policies on weddings.